I’m not sure how many rentals get this much love, but ours sure has had its share. Between our office restyle, to our curb appeal and brick patio makeover, our living space re-design and even our fabulous garage workshop, this beach bungalow is blushing! That’s okay, she’ll get used to all the attention. So, why stop now? Today, I’m giving you a peek at our bathroom’s mini-makeover, inspired by our friends at MirrorMate, who generously provided us with one of their fabulous, custom-designed frames to dress up what has been just an eyesore of a medicine cabinet mirror. I’ll then offer y’all some quick and easy DIY tips to liven up your loos and add pops of personality that’s sure to please. Here it comes…another decor hug. 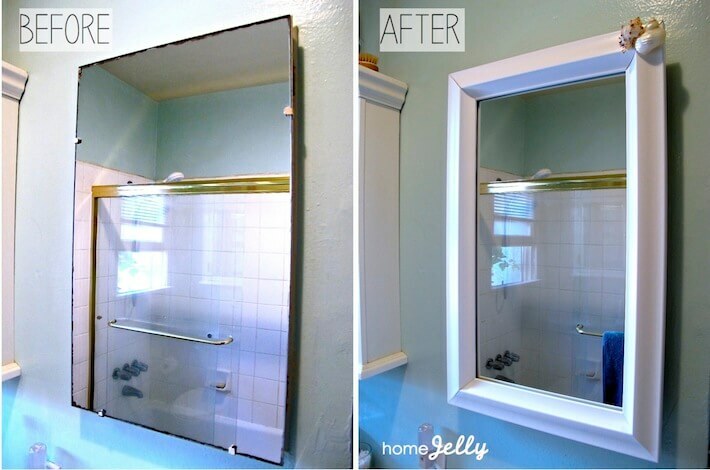 Bathroom mirror before & after. I dressed our ugly medicine cabinet with MirrorMate’s white Chelsea Classic frame. I had seen this done about 10 years ago at my friend Jeremiah Sullivan‘s house in San Diego. It looked so surprisingly elegant. I knew I wanted to do this some day, so, luckily, I ran into the MirrorMate folks at this year’s Design Blogger’s Conference and learned that they have this wonderful sticky back that makes adhering these frames oh, so easy! Easy assembly and simple mounting. DIY Disclosure: Okay…so, here’s a “getting real” moment I want to share with y’all. I was super crazy busy with about seven different projects this weekend (what was I thinking!?!). So, when it came time to assemble this frame, I accidentally used the wrong corner connecter (the large one, when I should have used the short one), and hammered it right through the front of the frame creating a noticeable tear…ah!! I thought it was ruined, but then, I recalled all the “patch work” I’ve seen on “Ace of Cakes”, where the frosting fondant cracked or got smooshed. They simply found/created something to cover it up, usually ending in a better looking cake than before the mishap. I used two mini-conch shells (this is a beach bungalow after all), and they fit perfectly together like ying and yang. New towel rack made from scrap wall moulding. Honestly, this update was a no brainer. I had just gotten so tired of guests leaving their wet towels on door nobs, on the bed, or on the floor…clearly this was an indication of not having enough towel hanging facilities. Not anymore! With just a simple scrap of wide plank moulding and some hooks, we had ourselves a custom towel rack! Nail on moulding…attach the hooks. Adding a glass piece to our painted wood shelf made cleaning and shining it so much easier. I had it custom-cut for about $12 at our local glass store (Redondo Glass). I also think it adds just a glint of elegance, don’t ya think? Glass topped shelving adds increased lux. Functional accessories that also color coordinate. We coordinated some accessories with our towels, like our merman and mermaid hooks (it’s hard to see in this photo, but its tail boasts patinated blue hues), birds, artwork, etc. This is so easy to do, frankly…and, if you wish to swap out your towels with another color, simply change out some of your accessories or add like-color flowers. 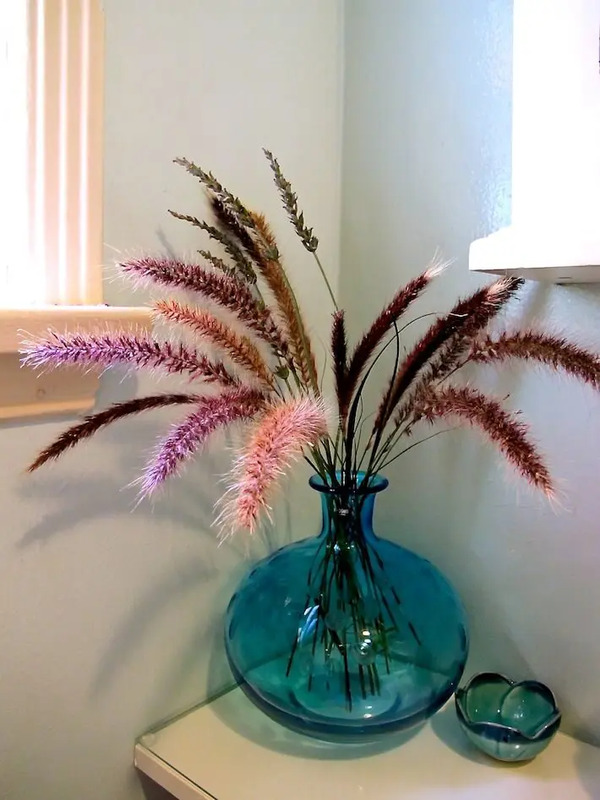 I brought the outdoors in by way of the natural grasses and pretty sprigs from some of my outdoor floral bushes. Besides the benefit of softening this small space, it’s free! Fresh, seasonal flowers and grasses soften any space. How have you mini-made over your bathroom space? Do tell! This is a sponsored post with affiliate links. The opinions are completely my own based on my experience.